I am quite interested in astronomy and This sounded interesting – On Sunday 26 January Telegraph readers can pick up a free Philip’s Planisphere, from WHSmith High Street and One Stop stores nationwide. The Philip’s Planisphere is an essential tool for all stargazers in unlocking the secrets of the universe. The star map shows the night sky, for every hour of each night of the year. By turning the oval panel to the current date and time, the Planisphere reveals the whole sky visible from your location. Whether you are an experienced astronomer or a complete beginner, the Philip’s Planisphere will quickly become an invaluable tool in exploring the stars, constellations and planets in the night sky. The Planisphere also comes with step-by-step instructions, and a seasonal guide to the night sky. Readers can also receive 20% off all other Philip’s Astronomy books from WHSmith High Street stores, including Stargazing 2014, Guide to The Night Sky, Stars & Planets, Month-by-Month Star Finder and the Practical Astronomy Kit. 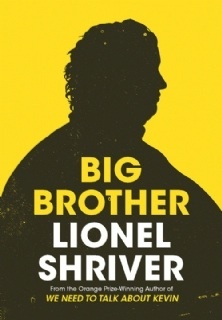 The Telegraph in association with WHSmith is offering readers the new novel Big Brother by Lionel Shriver, the Orange Prize-winning author of we Need to talk About Kevin. and with me being an avid reader I would like to get it. Readers can obtain the novel for £2.99 instead of the normal price £ 7.99, between Thursday, January 23, 2013 and Wednesday, January 29, 2014, or bring one of the printed vouchers published in the paper on Thursday, January 23, or Saturday, January 25. One day all this changes when Pandora’s brother Edison arrives in Iowa after a four year absence in need of a place to stay, Pandora literally doesn’t recognize him, The once slim, hip pianist is now penniless and morbidly obese after having gained hundreds of pounds. What happened? Edison seems to have a death wish pursued though the medium of fast foods and soon his appalling diet and know-it-all monologues are driving Pandora and her husband Fletcher insane. at first they commiserate with one another over the sudden undesirable proximity of Edison, however it’s only a matter of time before Fletcher who despises Edison for his weakness and is disgusted by his obesity, delivers his wife an ultimatum, it’s him or me. Curiously though, the marriage itself never seems to trouble the protagonist, it seems that her one and only problem is her penniless and morbidly obese brother, arriving at the novel’s beginning after a four‑year absence. The novel is written With Shriver’s distinctive wit and ferocious energy. Big Brother examines the reasons why we overeat, and asks, just how much should you sacrifice for someone who refuses to be saved? Entertainment Programme I’m A Celebrity…Get Me Out Of Here! French artist, engraver, illustrator and sculptor Paul Gustave Doré sadly passed away 23 January1883. Born January 6, 1832, in Strasbourg his first illustrated story was published at the age of fifteen. His talent was evident even earlier, however. At age five he had been a prodigy troublemaker, playing pranks that were mature beyond his years. Seven years later, he began carving in cement. 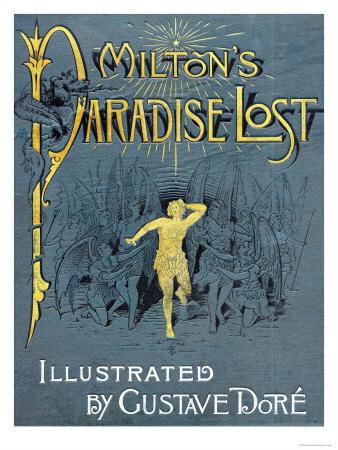 Subsequently, as a young man, he began work as a literary illustrator in Paris, winning commissions to depict scenes from books by Rabelais, Balzac, Milton and Dante.In 1853, Doré was asked to illustrate the works of Lord Byron. This commission was followed by additional work for British publishers, including a new illustrated English Bible. In 1856 he produced twelve folio-size illustrations of The Legend of The Wandering Jew for a short poem which Pierre-Jean de Ranger had derived from a novel of Eugène Sue of 1845. In the 1860s he illustrated a French edition of Cervantes’s Don Quixote, and his depictions of the knight and his squire, Sancho Panza, have become so famous that they have influenced subsequent readers, artists, and stage and film directors’ ideas of the physical “look” of the two characters. Norwegian painter and printmaker Edvard Munch sadly passed away 23 January 1944. Born 12 December 1863 in Ådalsbruk in Løten. He inherited his artistic talent from his mother and was related to painter Jacob Munch (1776–1839) and historian Peter Andreas Munch (1810–1863). Often ill for much of the winters and kept out of school, Edvard would draw to keep himself occupied, and received tutoring from his school mates and his aunt. Christian Munch also instructed his son in history and literature, and entertained the children with vivid ghost-stories and tales of Edgar Allan Poe. The oppressive religious upbringing by his Father, plus Edvard’s poor health and the vivid ghost stories, helped inspire macabre visions and nightmares in Edvard, who felt death constantly advancing on him. Munch would later write, “I inherited two of mankind’s most frightful enemies—the heritage of consumption and insanity.” By his teens, art dominated Munch’s interests. At thirteen, Munch had his first exposure to other artists at the newly formed Art Association, where he admired the work of the Norwegian landscape school. He returned to copy the paintings, and soon he began to paint in oils. In 1879, Munch enrolled in a technical college to study engineering, where he excelled in physics, chemistry, and math. He learned scaled and perspective drawing, but frequent illnesses interrupted his studies. The following year, much to his father’s disappointment, Munch left the college determined to become a painter. His father viewed art as an “unholy trade”.In 1881, Munch enrolled at the Royal School of Art and Design of Christiania. Munch demonstrated his quick absorption of his figure training at the Academy in his first portraits, including one of his father and his first self-portrait. In 1883, Munch took part in his first public exhibition and shared a studio with other students. During these early years in his career, Munch experimented with many styles, including Naturalism and Impressionism. Some early works are reminiscent of Manet, and he continued to employ a variety of brushstroke technique and color palettes throughout the 1880s and early 1890s, as he struggled to define his style. His idiom continued to veer between naturalistic, as seen in Portrait of Hans Jæger, and impressionistic, as in Rue Lafayette. He began to carefully calculate his compositions to create tension and emotion. While stylistically influenced by the Post-Impressionists, what evolved was a subject matter which was symbolist in content, depicting a state of mind rather than an external reality. In 1889, Munch presented his first one-man show of nearly all his works to date. The recognition it received led to a two-year state scholarship to study in Paris. His picture, Morning (1884), was displayed at the Norwegian pavilion.He spent his mornings in the studio (which included live female models) and afternoons at the exhibition, galleries, and museums. Munch was enthralled by the vast display of modern European art, including the works of three artists who would prove influential: Paul Gauguin, Vincent van Gogh, and Henri de Toulouse-Lautrec. He was particularly inspired by Gauguin’s “reaction against realism” and his credo that “art was human work and not an imitation of Nature”.By 1892, Munch formulated his characteristic, and original, Synthetist aesthetic, as seen in Melancholy (1891).In Berlin, Munch involved himself in an international circle of writers, artists and critics. 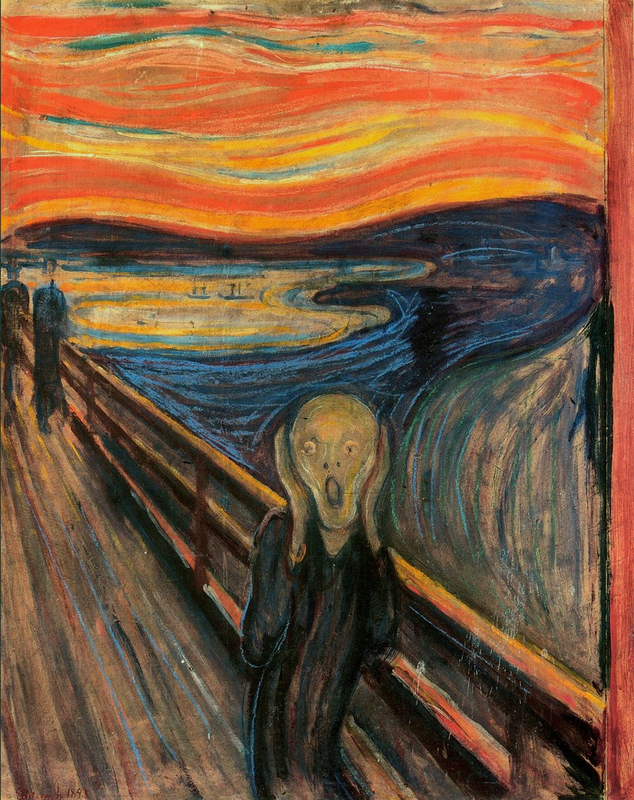 During his four years in Berlin, Munch sketched out most of the ideas that would comprise his major work, including The Frieze of Life, His other paintings, including casino scenes, Ashes, Death in a Sick Room and The Scream which is one of his best known works and was painted in 1893,& has been widely interpreted as representing the universal anxiety of modern man. Painted with broad bands of garish color and highly simplified forms, and employing a high viewpoint, the agonized figure is reduced to a garbed skull in the throes of an emotional crisis. It is one of only a few paintings, among them “Whistler’s Mother, Wood’s American Gothic and Leonardo da Vinci’s Mona Lisa, whose impact is immediate & meaning can be seen straight away. In December 1893, Unter den Linden in Berlin held an exhibition of Munch’s work, showing, among other pieces, six paintings entitled Study for a Series: Love. This began a cycle he later called the Frieze of Life – A Poem about Life, Love and Death. In 1896, Munch moved to Paris, where he focused on graphic representations of his “Frieze of Life” themes. He further developed his woodcut and lithographic technique. Munch’s Self-Portrait With Skeleton Arm. Munch also produced a multi-colored versions of “The Sick Child” as well as several nudes and multiple versions of Kiss. Munch returned to Christiania in 1897 and painted landscapes and his final painting in “The Frieze of Life” series, The Dance of Life . In 1900 he returned to Berlin, where he painted Girls on the Jetty to demonstrate the theme of feminine youth without negative connotations. In 1902, he displayed his works thematically at the hall of the Berlin Succession, producing “a symphonic effect”. Despite his success Munch’s self-destructive and erratic behavior continued, and after he got involved in an accidental shooting, his wife left him, this affected him deeply & he chanelled his bitterness into the paintings Still Life (The Murderess) and The Death of Marat I.In 1903-4, Munch exhibited in Paris where the coming Fauvists, famous for their boldly false colors, likely saw his works and might have found inspiration in them. When the Fauves held their own exhibit in 1906, Munch was invited and displayed his works with theirs.During this time, Munch received many commissions for portraits and prints which improved his usually precarious financial condition. After an earlier period of landscapes, in 1907 he turned his attention again to human figures and situations. However, in the autumn of 1908, Munch’s anxiety, compounded by excessive drinking and brawling, had become acute. Subject to hallucinations and feelings of persecution, he entered the clinic of Dr. Daniel Jacobson where he received therapy for the next eight months Munch’s stay in hospital stabilized his personality, and after returning to Norway in 1909, his work became more colorful and less pessimistic. Further brightening his mood museums began to purchase his paintings and he was made a Knight of the Royal Order of St. Olav “for services in art”. His first American exhibit was in 1912 in New York & produced several full-length portraits of high quality of friends and patrons & also created landscapes and scenes of people at work and play, using a new optimistic style—broad, loose brushstrokes of vibrant color with frequent use of white space and rare use of black.